Students taught by Teach for America teachers in five Texas regions match or outpace their peers in eight of nine academic subjects — an advantage that is strongest for black and Latino students, children learning English, and traditional district-run schools, according to new research. 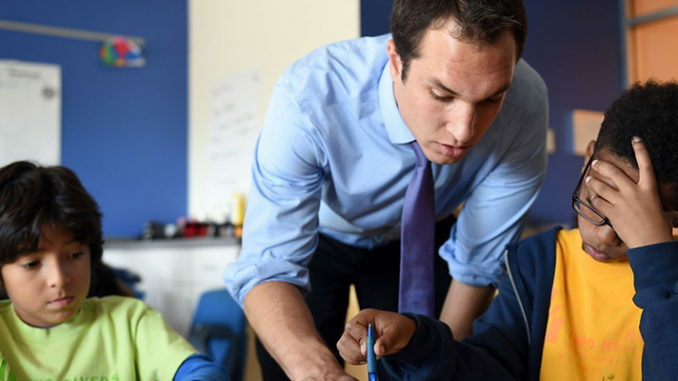 Pupils taught by veteran teachers who started as TFA corps members get the biggest boost. The newly released evaluation is the first to use Texas’s statewide annual assessments to compare students taught by current and former Teach for America corps members with those taught by traditionally trained teachers. Commissioned by TFA and conducted by researchers at Southern Methodist University, the study examined data spanning six years, nine content areas, and 10 grade levels. In keeping with past evaluations of the program’s effectiveness by a variety of researchers, TFA teachers had a positive impact on student performance in math and performed about the same as their traditionally trained peers in reading instruction. The new report also considers teacher effectiveness in a number of subject areas, including algebra, biology, social studies, and U.S. history. With the exception of reading, where the impact was statistically insignificant, TFA-affiliated teachers had a positive impact across the board. The report also took a first, early look at “saturation” — whether a concentration of TFA-trained teachers in a school or district has an impact. It found a positive relationship between student performance and a cluster of TFA-affiliated teachers in 53 percent of cases. Southern Methodist University Center on Research and Evaluation. Students taught by TFA alumni are 7 percent more likely to pass the state exams than peers taught by veteran teachers who did not enter the classroom through the alternative training program. TFA-affiliated teachers’ impact on black and Latino students and students with limited English proficiency was also greater. Researchers at SMU’s Center on Research & Evaluation (CORE) used Texas Education Agency data to assess the impact of TFA teachers in five regions — Austin, Dallas-Fort Worth, Houston, the Rio Grande Valley, and San Antonio. 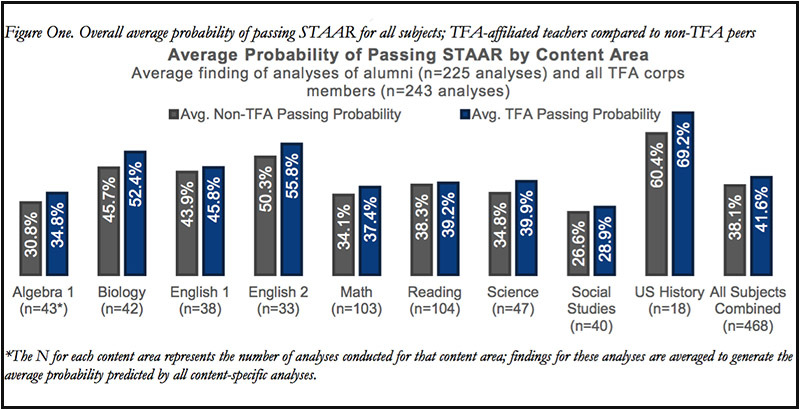 The evaluation builds on previous studies but is the first to examine TFA’s impact in Texas high schools and to use student performance on the State of Texas Assessments of Academic Readiness (STAAR) assessment. The researchers matched records of individual students taught by a TFA teacher in a given year, stripped of identifying detail, with records of similar students taught by non-TFA teachers. They also paired teachers by experience level.